Follow the money and right now money is moving into gold and select miners. In fact, there’s so much interest in “paper” gold that physical supply has utterly broken down. As in… crashed and about to burn in a roaring fireball! This is critical. The amount of physical gold in storage in Comex versus the number of registered “owners” against each ounce is nuts. From a few owners per ounce, it jumped to 542 by this March! Look at what’s happening. From the early 2000s to not long ago, the number of “owners” per ounce — people who bought a “paper” gold contract, supposedly backed by real metal at Comex — was basically flat, just a handful of claimants for each ounce. Plus, there were literally millions of ounces of gold on deposit in Comex. There was gold in the vault, in other words. If you showed up with a contract, you could walk away with gold. That’s how markets ought to work. Then starting in 2014 and trending to mid-2015, the number of registered “owners” moved strongly up, to about 100 per ounce, and then 300 per ounce. Note that this was also a period when Comex sold down significant amounts of physical inventory, from several million ounces in vaults to well under 1 million ounces. Most of this gold moved out of the West (London, Zurich, New York) to the East (China, Russia, India, Middle East). It’s gone forever… certainly from the West. It was nice while it lasted. 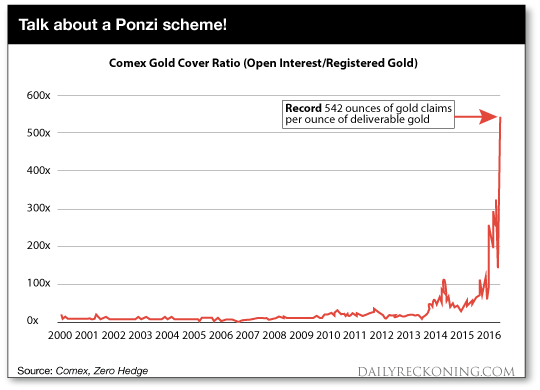 By late 2015 and now into 2016, registered “owners” against Comex gold spiked to a nosebleed level of 542-to-1. Thus if even one claimant shows up for an ounce of yellow metal, the cupboard will be bare — and there are 541 other claimants as well! By comparison, your child has about 30 times better odds of applying and getting admitted to Harvard, Yale AND Stanford than does a Comex contract holder have of walking away with one ounce of gold. Good luck with that! In essence, all hell has broken loose in gold trading pits. Naturally, the mainstream media (MSM) have not discussed it. No, MSM is too busy telling you how great things are again with Amazon, Tesla, Facebook, etc. That, and how inflation and unemployment are super-duper under control. Economy is growing nicely, thank you… Relax. Go shopping at the mall. Take a cruise. Buy something else you don’t need, with money you don’t have. MSM would never bother you with the fact that there’s almost no gold in trading vaults. Nor never mind that it would take years’ worth of new mine and mill production to refill Comex to anything approaching old levels. Face it, there “ain’t” no gold! It’s gone! Any working, functioning “futures” market requires physical supply to backstop against calls for delivery. Makes sense, right? That’s how it works for corn, wheat, orange juice, cattle, hog bellies, everything else. You can trade cattle futures until the proverbial cows come home; at some point though, cows wind up as hamburger on supermarket shelves. Yet with gold, there are almost no ounces of Comex gold available for the paper market. Thus is risk exploding for paper gold traders. A collapse may not happen literally overnight… but we’re looking at a very dangerous situation. By comparison, look at oil markets. With oil, there’s ample supply from six continents. I’ve read of tankers from Middle East nations literally slow-sailing the long route around Africa, to buy time for cargo owners to find a buyer at refineries in Europe or North America. Oil prices may be low by recent standards, but at least paper barrels are aligned with physical reality at wellheads and loading terminals. The cupboard is so bare for gold that Comex could collapse into the equivalent of a “run” on vaults. If that happens — rather, “when” that happens — watch gold prices spike. On that golden day of reckoning, you’ll see more than a buying frenzy or even a panic. It’ll be utter pandemonium. When this bomb explodes, gold prices will melt upward in ways we can scarcely imagine. Instead of a few dollars up or down on the ticker, you’ll see hundred-dollar moves in a matter of minutes. Of course, it’ll be a good day for investors who own physical metal and a strong hand of mining shares. Own physical gold. If you don’t have some, get some. 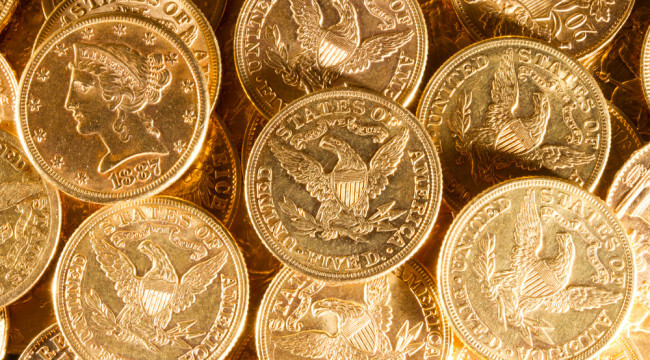 Go for basic bullion coins. Don’t worry about numismatic coins. Don’t pay big premiums. Just get U.S. Gold Eagles, Canadian Maple Leafs, South African Krugerrands, etc. Build your stash while you can, because some day, you won’t be able to get gold, period. My view is that we’re in a sweet spot. Any rebound (short or long term) can vault you high and far when the turnaround hits. And it will hit. Sooner or later, it will hit. P.S. The Federal Reserve is determined to drive down the dollar. And owning gold is the best way to preserve your wealth against a depreciating dollar. That’s why we’ve produced a FREE special report called The 5 Best Ways to Own Gold. We’ll send it to you when you sign up for the free daily email edition of The Daily Reckoning. Every day you’ll get an independent, penetrating and irreverent perspective on the worlds of finance and politics. And most importantly, how they fit together. Click here now to sign up for FREE and claim your special report.